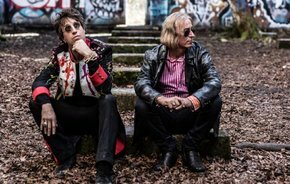 Joseph Arthur is a very good singer / songwriter, and REM’s Peter Buck doesn’t need any plaudits given his past. Together they’ve worked a bit on each other’s stuff, and Arthur supported REM on tour, but now they’ve teamed up for a full collaborative LP. We really hope the music is more inspired by that name change, but we have a song to stream below called I Am The Moment, and weirdly it sounds exactly as you’d expect. So, do you want some cloying PR quotes? “My first thought was, ‘Hey, I’ll get Peter to play acoustic guitar on some of the stuff I’m working!’ So I started showing him songs. But he was like, ‘That’s cool. Now check this out.’ And he started playing chords and whatnot. So I put my guitar down and began singing over his changes, and it was magical. It was easy. And these great songs just started popping out.” Thanks Arthur. Release date is June 15th.